Jaded Blossom: Guest Designer, Katy! Hey guys and gals...it's Katy from An Inside To My Heart! I'm SUPER EXCITED to be guest designing over at Jaded Blossom while their talented DT takes a much-needed break for the Holidays! One of the things I absolutely LOVE about Christmas is BAKING COOKIES!!! 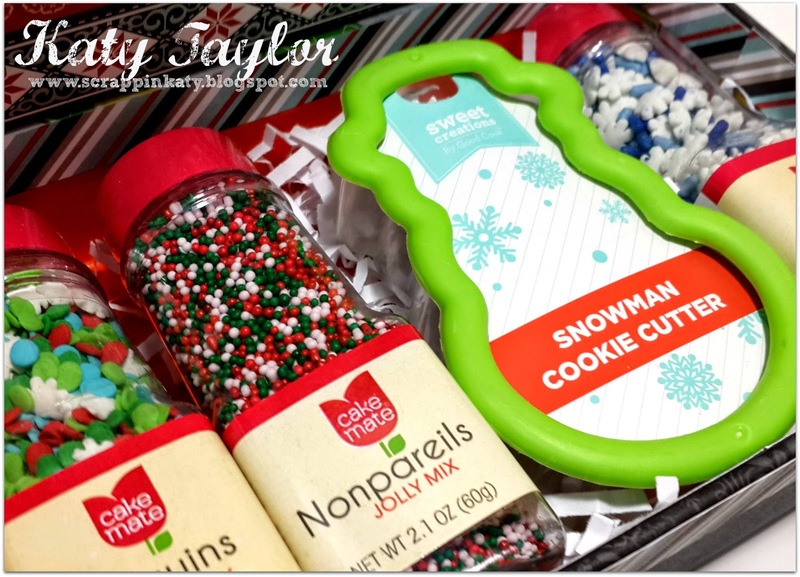 When I saw the Cookies for You stamp set, I knew it would be perfect for this family tradition! I originally planned on using it for my December Daily Album but since we haven't come to that activity yet, I decided to make this CUTE box full of everything you need to decorate sugar cookies! Here are some closeups...this stamp set actually says a whole LOT more but I wanted it to be a square so I masked it off...LOVE that about Photopolymner stamps...you can see right through them so you know what you're doing! How SIMPLE and CUTE would this be for your neighbors, your co-workers, your grandchildren...anyone who loves to BAKE!!! Thanks for stopping by! Don't forget to check the Jaded Blossom Blog every day of December for a NEW Guest Designer...talk about LOTS of inspiration! This is gorgeous and such a wonderful gift! LOVE how you did the tag stamped in the different colors! Wonderful project. Love how it all came together. Awesome idea! Great Job! This would be a great great gift! Katie, this is such an awesome idea!!!! Beautiful project!!! wow, this is very cool and so yummy. Great idea Katy! Love the pop of red in the tag. Super fun gift for someone who loves to bake. What an awesome gift idea!! I LOVE IT!!!! Love it - now that's a gift they won't get 2 of! So cute!! What a great gift! Fantastic gift idea and so very cute!!! It's a perfect gift! I love this! Such an awesome idea! This is beautiful! It is so classy :) This is a perfect gift idea for our neighbors with kids. what a cute idea! love this and the color combos are awesome! Such a cute idea - love the oven mitt. Oh my! This is very possible the best idea I have seen in a long time for a Christmas gift! Super fun gift and it is packaged so cute! !